For the first time in years, I decided to draw something straight from Narnia. This is from Prince Caspian, when Lucy meets Aslan in the middle of the night and walk through a forest with almost human trees. The sketch was first done with a pencil, then the lines with a marker and finally the picture was colored with watercolors (not my favorite medium, but I have been experimenting a little with them for a few months). You can find the better quality picture behind this link. The one above might not show the whole image. I hope the links work, the hosting service I used to use has changed and I had find another way to link them. My first thought was, "Oh, yay! Mehinen's done a new piece!" It's lovely! 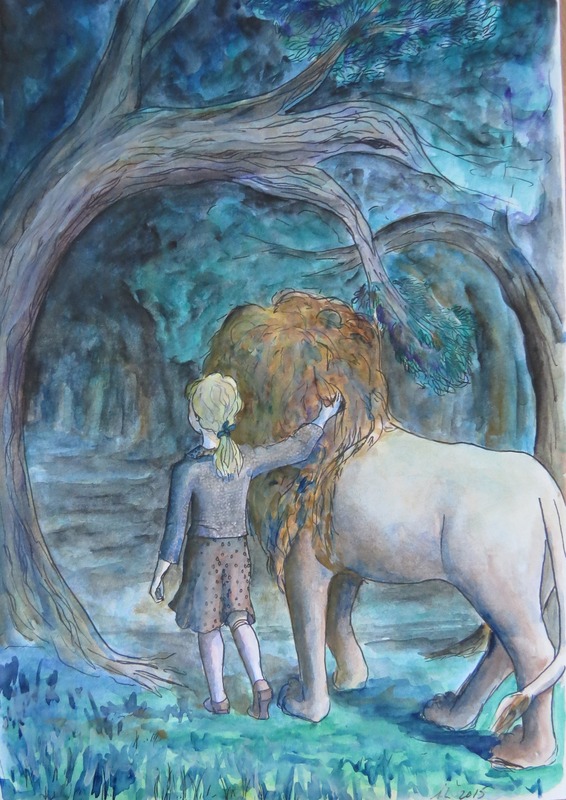 I like the way you can see Lucy is drawing courage from being in the company of Aslan, the forest at night and the consistent lighting... that's not easy to pull off in any medium and you did it with watercolor. Meltintalle, you have no idea how much you have warmed my heart just now . You still remember me! Thank you, it was not an easy painting. I got a few surprised while doing it, as I'm used to doing shadows with several layers ("Why are the colors mixing? They are supposed to have dried already!"). Acrylics are definitely easier to work with. And I still don't like Aslan's paws. But I'm glad you like the lighting and forest! I really wanted to show how they are entering a dark forest at night from the glade filled with moonlight, and tried to make the contrast between cold, white light and shadows without the picture looking black and white. From my limited watercolor experience, I can believe it was hard to do. But mostly I'm just going, "WOW." Very nice work! I'm a huge fan of blue, so this is a treat. Nice pose on Lucy, too! I'm not a painter at all, but I really do love what you have done. Thank you 8SilverSky, coracle and wild rose! 8SilverSky: Lucy's pose was at first hard to do, but a wooden model and some walking in front of a mirror helped to correct the stance. Coracle: I'm glad you like it! Wild rose: I agree, especially simple watercolor paintings can sometimes be absolutely stunning! Not my favorite medium to paint with, but some people can make beautiful landscapes with it. Aslan is partly from reference photos, as it was a bit difficult to quess how a cat's feet move while walking. Wow! This is absolutely beautiful! I'll say that for a moment there I was taken back to that same feeling I had years ago when concept art for the films was unveiled; and that was a wonderful feeling. I too love this moment and I think that you captured both the intimacy and radiance within the scene brilliantly. The colours you chose reflect that warm glow of the setting you painted as the two walk through the forest together and I love the angled perspective of looking further ahead into the wood while Lucy and Aslan seemingly pause in the mystery of the night. Smooth, soft, and magical. Truly Narnian. Fantastic work! I have always enjoyed your art and look forward to seeing some more! Thank you, Quinlin! I'm not sure, but I don't think that anyone has ever compared the feeling in my work to film concept art . I'm glad that you thought it captured the magical feeling of the scene, as I wanted to be real and otherwordly at the same time. It wasn't easy to choose colors, as they had to look cool in the moonlight but not cold (I can't imagine cold-colored Aslan). And it was summer, on top of all, so there had to be some warmth in the scene! That's beautiful work! Very Very nice.